The fields of cartography and geoinformation science are becoming more relevant than ever. Without maps, people would be spatially blind. Knowledge about spatial relations and the locations of objects is extremely important for enabling economic development, managing and administering land use, handling disaster and crisis situations, and even simply showing people how to get from one place to another. Cartography is also becoming more contemporary, thanks to new and innovative technologies. Maps can now be derived automatically from geodata acquisition methods such as laser scanning, remote sensing, and sensor networks. Cartographers can also build smart models of geodata, which allows in-depth analysis of structures and patterns. Additionally, maps can now be presented in a range of forms, from maps on mobile phones to augmented reality presentations that let viewers see live, real-world environments with amplified features using computer-generated sensory data. To probe deeper into these ideas and developments, the International Cartographic Association (ICA) is looking forward to hosting the International Cartographic Conference (ICC) 2015 in Rio de Janeiro, August 23–28. There will be high-profile keynote speakers; exciting technical sessions; cartographic and technical exhibitions; a children's map competition; a Brazilian side program—including a soccer game at Rio de Janeiro's famed Maracanã Stadium—and, of course, the opportunity to be where the people and ideas of modern cartography are converging. With a wealth of rich topics on offer, the International Cartographic Conference will give attendees the opportunity to learn about the newest developments, results, ideas, and products of modern cartography. Some sessions will cover practical issues such as cartography for sustainable development, while others will be more conceptual and classic, focusing on cartographic theory or topographical mapping. Still others will be technical, bringing attention to subjects such as GIS cloud computing, location-based services, and 3D and 4D cartography. ICC 2015 will bring together an array of cartography and geoinformation researchers and practitioners from around the world to reflect on the relevance, attractiveness, and contemporaneity of maps and cartography. To enhance the list of attendees, I would like to cordially invite all of you to join the global family of cartography and GIScience by participating in the International Cartographic Conference 2015 in Rio de Janeiro. For more information, visit icc2015.org. 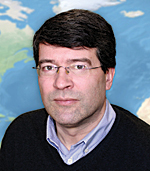 Georg Gartner is a full professor of cartography at the Vienna University of Technology. He holds graduate qualifications in geography and cartography from the University of Vienna and received his PhD and habilitation from the Vienna University of Technology. He was awarded a Fulbright grant to the University of Nebraska at Omaha in 1997 and research visiting fellowships to the Royal Melbourne Institute of Technology in 2000, South China Normal University in 2006, and the University of Nottingham in 2009. He is the responsible organizer of the International Symposia on Location-Based Services and editor of the book series Lecture Notes on Geoinformation and Cartography, published by Springer. He is also editor of the Journal of Location Based Services, published by Taylor & Francis.